For some time, Pershore Arts has been in the fortunate position of having funds to spare. At last year’s AGM, we all agreed that we should find a suitable project to spend some of this money on. 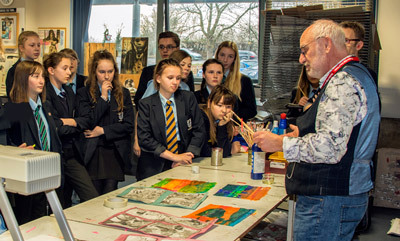 Your Committee felt that it would be appropriate to invest in support for young artists and with that in mind we met with David Reed, Head of Art at Pershore High School. Frans has worked closely with Chris Cronin to agree the following dates for Pershore Arts' members to visit the Walled Garden at Croome to draw, paint and take photographs. The time slot for all these dates is noon until 4.30pm. Other time slots may become available – we will let you know by email. Entry is via the London Arch, with parking in a large car park, second left. The code for the gate was emailed to members in December, but if you have mislaid it, please contact us. Major earthworks are under way during the winter, so please pay attention to any instructions given by the workmen in order to keep safe and not get in the way. All artwork for our Annual Exhibition, on the theme “Walled Garden”, needs to be ready for installation between 4 and 6pm at Number 8 on 19th April. The Exhibition runs from 20th April until May 10th. Geoff Hodgson has once again kindly provided intriguing themes for these meetings, and the dates for 2017 are now on our website Calendar. Remember, ALL members who like taking photos are welcome to come along and share their current work - YOU DO NOT HAVE TO BE AN EXPERT. No competitions - these meetings are chatty and very informal, but there is always something to be learnt from the way other people use their cameras. Work can be shared in print or via your iPad, so you don’t have to go to any expense. You really have no excuse not to pop in and join us! Our introduction to printmaking takes place on 21st January 2017. This will be led by the very knowledgeable Andrew Judd, assisted by members of St. Peter’s Printmakers, at St. Peter's Church in Malvern. It should be a good opportunity to find out more about the possibilities of an exciting medium, and a fun, creative day to brighten January. Some members are sharing transport – please contact us if you need directions or help getting to the venue. If you missed this one, future taster days are planned. Pershore Arts’ Committee members are always on the look-out for new places to show our work, so we are very pleased this year to announce the opportunity to exhibit at County Hall, Worcester. There is plenty of space, on two large boards, for pictures, so please bring work A3 size or larger. There is also space for 3D exhibits, including cards created from your artwork, in two large glass cabinets. Work can be available for sale, via contact through our website, or through individuals’ contact details. Work is to be brought in for hanging on Monday 20th March – time to be confirmed. WALLED GARDEN - LAST CHANCE! Last dates for Pershore Arts' members to visit the Walled Garden at Croome to draw, paint and take photographs are Wednesday March 22nd and Thursday 23rd. The time slot for all these dates is noon until 4.30pm. Entry is via the London Arch, with parking in a large car park, second left. The code for the gate was emailed to members in December, but if you have mislaid it, please contact us. Major earthworks are on-going, so please pay attention to any instructions given by the workmen in order to keep safe and not get in the way. All artwork for this exhibition, on the theme “The Walled Garden”, will be installed between 4 and 6pm at Number 8 on 19th April. The Exhibition runs from 20th April until May 10th. We hope to transfer some or all of the exhibition to another venue afterwards, possibly at Croome itself. It is a good idea to make a scan or photographic record of your work, so that, if you sell your original artwork, you could still exhibit digital prints of the images at a later date. An exciting series of art films are being screened at our favourite local cinema. The next will be “The Artist’s Garden: American Impressionism” showing on Tuesday 28 March - 7.00pm. “I, Claude Monet”, an insight into the man who gave birth to Impressionism, will be shown at 7pm on Tuesday 16th May. In June, you can find out more about the life and work of one of the world’s greatest artists, in “Michelangelo: Love and Death” Tuesday 20 June - 7.00pm. All members who sketch, paint or draw are invited to come along, have a chat and share their work and ideas. Sketchbook Group is very informal and a good place for inspiration and encouragement. If you ‘do’ Facebook, you may also be interested in joining the Facebook group ‘Inside Your Sketchbook’ – you will be surprised, impressed and inspired by the extraordinary variety of work, from artists all around the world. ALL members who like taking photos are welcome to come along and share work on the month’s theme or any other. Meetings are relaxed and friendly and there is always something to be learnt from the way other people use their cameras. Work can be shared in print or via your tablet/iPad, so you don’t have to go to any expense. In January, Andrew Judd and members of St. Peter’s Printmakers led a very successful day of printmaking at St. Peter's Church, Malvern. It was a happy, creative day to brighten January – you can read more about it in the latest Newsletter. If you missed it, future taster days are planned. A good turnout is expected for the installation of our Annual Exhibition next week, from 6pm on Wednesday 19th April, at Number 8. We have an impressive 42 pieces to exhibit, and having seen some of the Walled Garden themed work, it is going to be a great show! Exhibitors: please bring your work for installation between 6 and 7pm, clearly labelled and with mirror plates to attach it to the wall. We plan to have an informal gathering and a few celebratory drinks in the bar, once the work is safely installed, so please stay on for this, and if you are not exhibiting, come and join us at 7.30pm - or earlier if you’re handy with a screwdriver and a spirit level! Next month, our Sketchbook Group meeting will be at the Star at 7.30pm on Thursday 18th May. The garden is lovely, so if the weather is kind, should be a good subject for sketches AND photographs, so all sketchbookers and photographers are welcome to join us. If the weather is inclement, we will just have to work in the bar! An exciting series of art films are being screened at our favourite local cinema. The next will be “I, Claude Monet”, an insight into the man who gave birth to Impressionism, will be shown at 7pm on Tuesday 16th May. In June, you can find out more about the life and work of one of the world’s greatest artists, in “Michelangelo: Love and Death” Tuesday 20 June - 7.00pm. Following our exhibition at County Hall, we are now invited to exhibit at The Hive, the central library for Worcester and the University. There is one wall space in the cafe area, dimension roughly 7 x 1.5 m. To allow a good number of members the chance to exhibit, no image submitted can be bigger than A3. There will also be a point of sale for 3D work, such as craft and cards. The Library will charge 25% + 20% VAT on sales, so your prices need to reflect this. Hire charges will be met by Pershore Arts’ funds. The event is planned for 3 weeks during September. Our exhibition at the Evesham Arts Centre has been confirmed for 7th November 2017 to 5th February 2018. We will ask for interested parties to let us know nearer the time. Next month, our Sketchbook Group meeting will be at Bricklehampton Hall. We have arranged a time slot of 2.00pm to 8.30pm on Thursday 13th July, to allow access to as many members as possible. The grounds are beautiful, so if the weather is kind, should be good for sketching AND photography, so all sketchbookers and photographers are welcome to join us. Sketchbook Group is very informal and a good place for inspiration and encouragement. If you ‘do’ Facebook, you may also be interested in joining the Facebook group ‘Inside Your Sketchbook’ – you will be surprised, impressed and inspired by the extraordinary variety of work, from artists all around the world. ALL members who like taking photos are welcome to come along and share work on the month’s theme or any other. Meetings are relaxed and friendly and there is always something to be learnt from the way other people use their cameras. Work can be shared in print or via your tablet / iPad, so you don’t have to go to any expense.